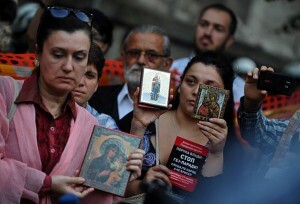 Serbian ultra-nationalists protest against Swedish artist Elisabeth Ohlson Wallin’s photography exhibition “Ecce Homo”. This started when the LGBT parade in Belgrade was banned for the second year in a row. The fact that Jesus is depicted as a transvestite and surrounded by LGBT Apostles is solid reason to make a lot of complaints. Photography which imitates Leonardo da Vinci’s masterpiece “The Last Supper” caused so much confusion that the exhibition had to be kept twenty-four hours a day. This photography is one of the 12 works in artist’s controversial and shocking exhibition which are based on a new interpretation of biblical motifs. E.Wallin’s group photos in which Jesus is depicted surrounded by transvestites, transsexuals, fetishists, sadomasochists, AIDS / HIV carrier, initiated a huge debate in Sweden where they first appeared in 1989. Meanwhile in Belgrade “Ecce Homo” provoked a storm of protests. It was necessary 2000 policemen to cope with protesters. The exhibition was intended to celebrate the LGBT parade, but politics cancelled this event because of security problems and opposition leaders’ pressure.